What an eventful day it proved to be at Silverstone Classic on Saturday 21st July, the morning started at the Media Centre to collect my media pass and Official Photographers bib which gave me access track side. Some very nice Tesla owners gave up their day to drive media people and VIP's to designated points during the event. The first 5 races took place at the National Paddock during the morning with the remaining 7races taking place at the International Paddock in the afternoon. The variety of photographs from the days events show track side activity, World GP Bike Legends before an exciting demonstration. 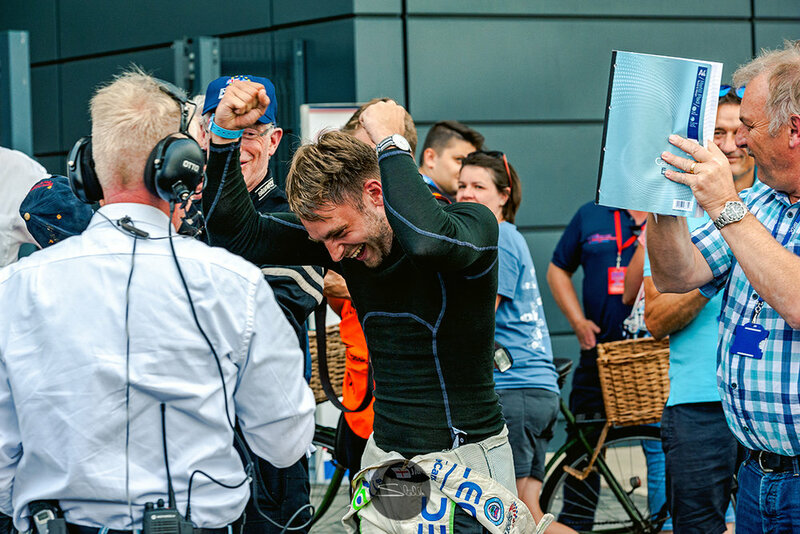 On the podium there was happiness and victory for the likes of Christophe D’Ansembourg, William Nuthall, Jake Hill, Steve Tandy and Nick Padmore amongst others. For those of you who are interested in my kit, I used Nikon bodies D750 and D700 with prime lenses 18mm and 50mm and zooms 70-200mm and 24-120mm with a Nikon Speedlight SB-910, I also introduced to the mix a Fuji XT-2 body with a16-55mm lens for when the other bodies became too heavy! I hope you enjoy the photographs and the story they each tell of an action packed day, scroll down to see the link to further images and the results of the day. To view further images of the day please follow this link and to find out the results of the races please click here. 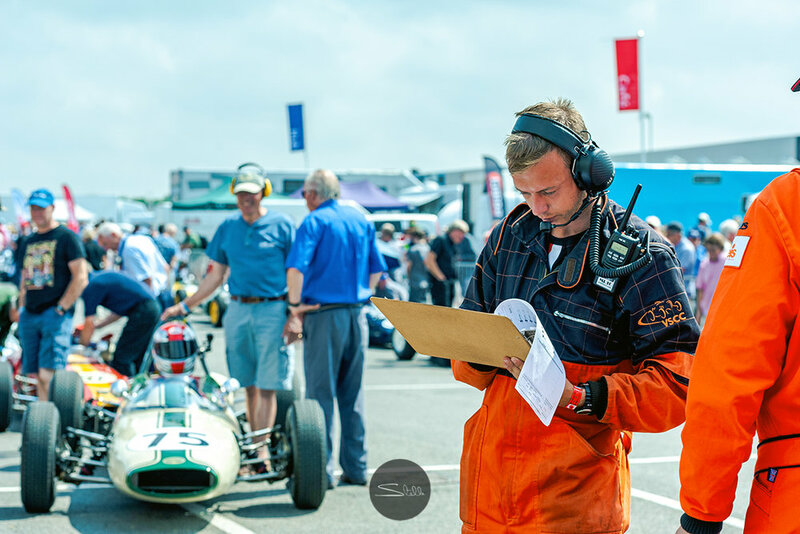 I gained accreditation to attend the pre-race days at the Silverstone British Grand Prix on Thursday 5th and Friday 6th July to photograph Sergey Sirotkin. Sergey is the young Russian driver currently competing with Williams-Martini, one of the worlds leading Formula One teams, to give a behind-the-scenes look at what this up and coming racing driver does in the Paddock before a race. The photographs will feature in a Russian, London Lifestyle Magazine called Rutáge, which is due for publication in August, once this has taken place I will be able to share my blog about Sergey next month. Whilst I was in between photo-calls I managed to capture other Formula One racing greats, including Lewis Hamilton and Valtteri Bottas from Mercedes AMG Petronas; Ferrari drivers Sebastian Vettel and Kimi Räikkonen; Team Principal Christian Horner of Red Bull Racing and drivers Daniel Ricciardo and Max Verstappen; Vijay Mallya, Team Principal of Sahara Force India and drivers Sergio Perez and Esteban Ocon. Others to look out for are Stoffel Vandoorne and Fernando Alonso from the McLaren Formula 1 Team, and Brendan Hartley and Pierre Gasly from Scuderai Toro Rosso, also George Russell currently competing in Formula 2. The Paddock was a hive of activity with drivers, technicians, engineers, media teams and crews, Team Principals and visitors, including tours for small groups of school children and children from Great Ormond Street Hospital - there were racing heroes from the past including Damon Hill signing autographs. The photographs above are a selection from my two days, showing the Sky Sports F1 live broadcast on the grid featuring fun and games in front of the fans in the grandstands, autograph signing and interviews. 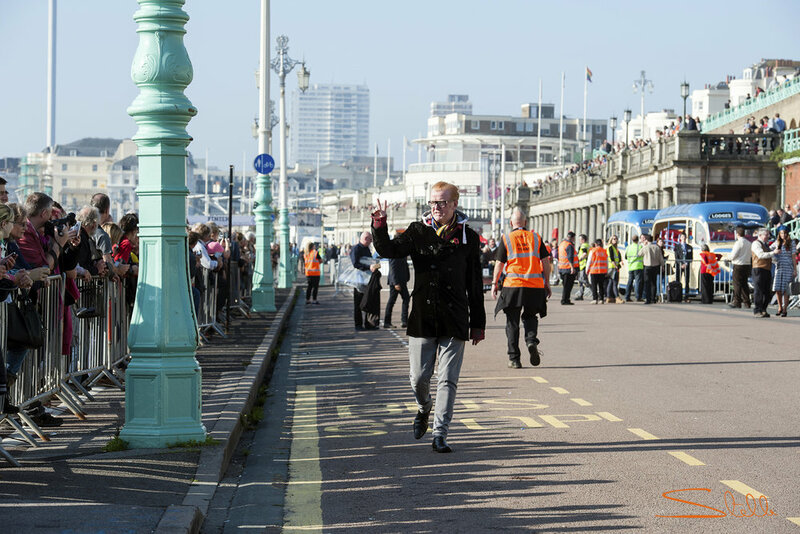 To see a wider selection of images simply click here to the events section of the website. To obtain media accreditation to the British Grand Prix I had to apply to the FIA requesting permission, stating the nature of my intended visit, once permission was granted I was able to bring my ideas together for the feature on Sergey Sirotkin. The scrolling photographs above show the different passes that all media accredited people are given for security purposes, and to make their time and workflow efficient, these include car parking, media room, Pit Lane and Paddock access. It was a fascinating and fully engaging experience which opened my eyes to the wonderful world of Formula One. Thank you to the FIA for issuing me with a Paddock Pass, Williams-Martini for their hospitality and co-operation, Rutáge for commissioning the story, and the other people behind-the-scenes at my studio, but not forgetting a very big thank you to Martin Turner for steering me in the right direction, without him this would not have happened! I interviewed and photographed Martin last month for an 'In Conversation with..' blog which can be read here. 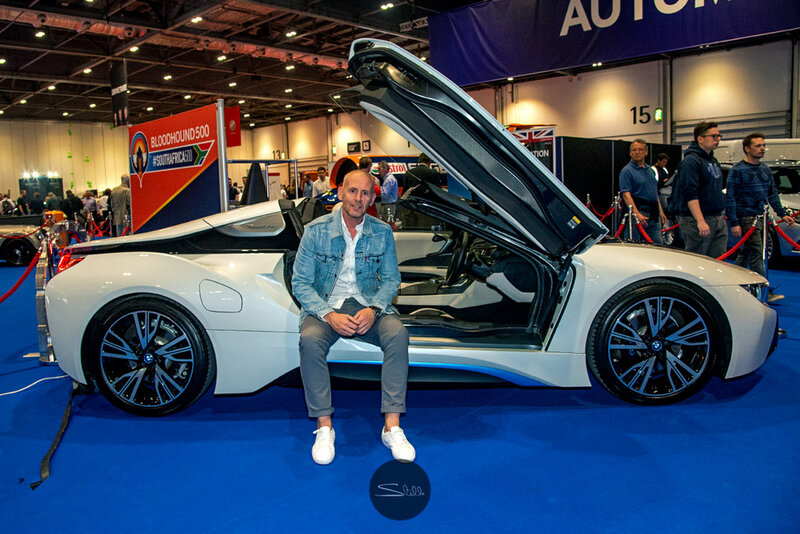 On Thursday 17 May The London Motor Show at ExCel opened it's doors to an exclusive afternoon to the press, trade and VIP's to showcase all the event has to offer. HRH Prince Michael of Kent officially opened the show with an entertaining mix of cars and interviews with professionals in the industry. I enjoyed photographing the afternoon at it's new venue having previously been in Battersea Park from its beginnings three years ago. Below are a few of the highlights from the evening. The show is on until 20 May with doors closing at 5pm this is the link to their website. To see additional images from the event please follow this link. It was a fun afternoon and good to meet old friends, make new ones too and of course to see what's new in the world of cars. Enjoy! 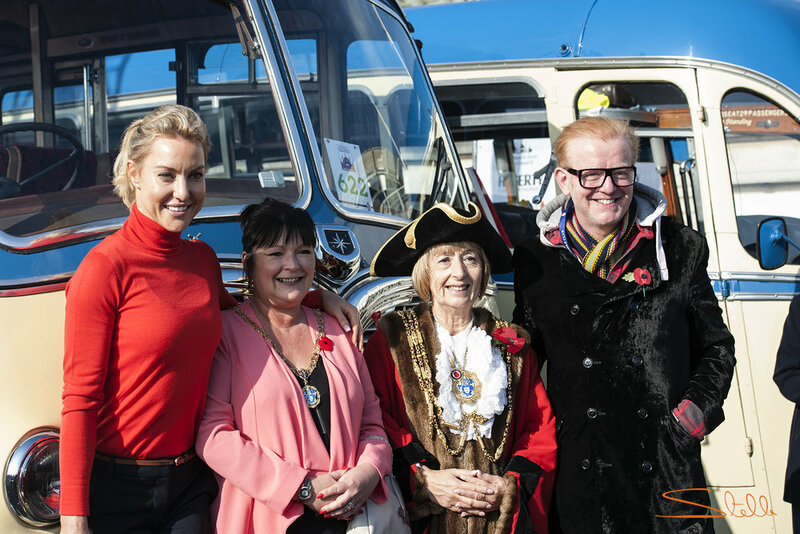 To see a variety of other photographs from the event please click on this link to the 'Events' page. It has been three years since the launch of my inaugural exhibition 'A Drive Down Memory Lane' - and I can't believe where the time has gone! Since then, the exhibition has featured at the Royal Automobile Club, Pall Mall, Mayfair, London - Hever Castle, Kent - Eve Gallery at Top Foto, Edenbridge, Kent and for an invitation-only day at the Bremont Boutique, Mayfair, London - where attendees were given the opportunity to purchase the framed photographs in limited editions of 25. I am now delighted to share with you the news that for this Christmas season only, the exhibition is on display at my studio SMS Creative Photography in Oxted, Surrey to allow you to select a favourite photograph for yourself or to treat a loved one. The photographs can be purchased framed or unframed. To view the collection of the 44 photographs online you are welcome to click here - and if you spot an image that might interest another car lover please feel free to share the link, thank you! Each photograph is personally signed and I can also personalise it for you if it's a gift for someone special. Please call SMS Creative Photography on 01883 722282 if you are interested in this exclusive Christmas offer. Thursday 31 August was the opening of the world renowned Salon Privé in the grounds of Blenheim Palace, majestically placed on the South Lawn, now in its 3rd consecutive year. Salon Privé continues to attract some of the most important collector cars in the world - with a 12-year history, Salon Privé is firmly established as the UK’s most prestigious luxury Classic and Supercar Show & Concours d’Elégance. I had the pleasure of photographing the day for the 2nd year and this year's show didn't disappoint. As well as photographing I spoke to a few of the owners to hear about the history of their cars, one in particular stuck in my mind - a stunning 1973 Ferrari 365 GTS/4 'Daytona Spider', bought in the late 80s, this very car won the trophy for the People's Choice and quite rightly too. The selection of photographs below tells you a little more about how the day unfolded. The day started with the world premiere of the all-new ATS GT - the first ATS for more than half a century - Automobili Turismo e Sports owner Daniele Martian explained the ethos of the team of talented young people bringing back this historically important brand. Trophies basking in the sunlight, lined up ready for the afternoon presentations. Judge, Vincent Van Der Vinne - automotive historian, and writer speaking to the owner of the 1973 Ferrari 365 GTS/4 Daytona Spider. This year the panel of judges were: Derek Bell as Chief Judge, Keith Bluemel, Henry Cole, Fabio Filippini, Marco Makaus, John Mayston-Taylor, Yasmin Le Bon, Hugo Modderman, Steve Parrish, Jeff Smith MBE, Frank Stephenson, Giles Taylor, Vincent Van der Vinne and youth judges, Ben Barkaway, Harvey Stanley and Marcus Willis with Max Girardo - Master of Ceremonies. Seen above (l-r) Jeff Smith MBE, Steve Parrish, Max Girardo, His Grace, the 12th Duke of Marlborough, Yasmin Le Bon, John Mayston-Taylor, Frank Stephenson and Marco Makaus. Some of the motorcycles needed a push! Most OTT Motorbike: 1971 Kawasaki Millyard H1 500LC. Jalil Rehman - Executive Vice President and Chief Business Operations Officer of Chubb Insurance, with Master of Ceremonies Max Girardo and His Grace, the 12th Duke of Marlborough (l-r). Taking home top honours, with the Best of Show Trophy, was the revered and much-discussed 1960 Alfa Romeo 6C 3000 CM Pininfarina Superflow IV. This rare Alfa Romeo is the final evolution of four concept cars in one. The car initially began as a 6C 3000 CM race car, (driven by none other than Juan Manuel Fangio, taking 2nd place in the 1953 Mille Miglia), of the eight 6C 3000 CM's built, two were converted to street cars. Chassis #00128 was then given to Italian designer, Pininfarina, who used the chassis to evolve four prototype design studies ending with the Superflow IV with its Plexi roof. 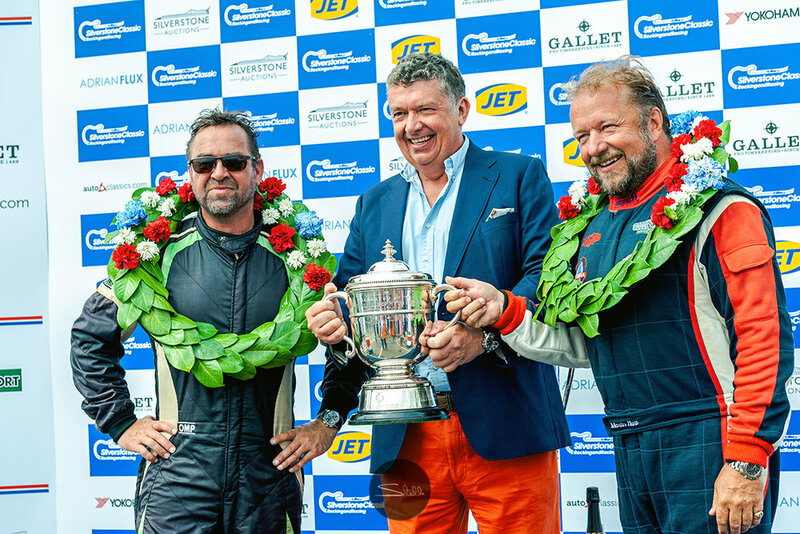 Trophy presentation by His Grace, the 12th Duke of Marlborough and Jalil Rehaman - a car that hadn’t been shown in the UK until Thursday’s Salon Privé Concours debut; it shook off fierce competition in the Curvaceous Coupes Class, and will return to its home in the USA with not only the Best in Show Trophy but also a Best in Class award. I can see why this Alfa Romeo won the Best in Class award as well the Best of Show trophy, it really is a car with class and style, I spoke to the owner who said people refer to it as the bubble car, I'm not sure that does it justice! Andrew Bagley, Concours Chairman announcing the Special Award for Most Original Post-War: 1969 Aston Martin DB6 MkII. Built in 1969, this car is in exceptional condition with unbroken history and matching numbers. Chassis #4312 is a multiple award-winning car in both Concour d'Elégance and rallies. It is one of 5 in this particular colour Bahama Yellow and special to its kind, it has the capacity of changing the perceived colour depending on the lighting conditions. Judges Henry Cole, Derek Bell MBE, Steve Parrish and youth judge Harvey Stanley. This special 1967 Lamborghini Miura P400 having only returned from Italy and Lamborghini’s in-house restoration team, Polo Storico, in July, took home top honours in the Evolution of the Supercar Pin-Ups Class. The current owners and recipients of the award. This car was delivered to its original owner in late 1967, who gave it the nickname 'Tamuira' after his fiancée and reigning Miss Italia Tamara Baroni. One-of-37 ‘covered headlamp’ 1961 Ferrari 250 GT SWB California Spider restored in the UK during 2012, this exceptional SWB-variant California Spider wowed judges, becoming Best in Show runner-up, and taking home a Best-in-Class win in the Riviera Cruising category. His Grace, the 12th Duke of Marlborough presenting the trophy. I think you'll agree this is one of the most desirable open top GT cars ever made. Other winners of Italian descent include the last-ever UK-delivered, right-hand-drive 1973 Ferrari 365 GTS/4 ‘Daytona’ Spider, one of just 122 that originally left the Maranello factory in that specification. Remaining with its current owner for over 30 years, it won the hearts of Salon Privé guests and took home the People’s Choice Award. Thanks for reading, I'm already looking forward to next year at Salon Privé - to view more photographs from the day please follow this link to my website. I'll be back next month with more news! On Saturday 30 July I collected my media pass, track side vest and then immersed myself in the world of motor racing, boy did I have fun! I'd like to share with you a few moments I captured from the day. Last year I had the pleasure of photographing The Elite London 2015. If you are into the jet-set luxury lifestyle and have a passion for cars and aviation then come out to play, and enjoy a day or two at this exclusive event at a private location in Kent. This year I'll be showcasing my classic and supercar photography of Limited Edition framed photographs, or, to commission a shoot of your own collection to have a bespoke book crafted, the perfect gift for the man or woman who has everything, come and find my stand, D7. Now in it's third year, there is a whole host of luxury items to experience and enjoy at this unique summer event, to browse the very best the luxury and lifestyle industries have to offer. I have 10 pairs of complimentary tickets on a first come first serve basis, please email me your address stella@stellascordellis.com so I can send them to you. This link to The Elite London 2016 website will tell you more about what's in store. Look forward to seeing you! Always an opportunity to take a photograph! And a Spitfire display to complete the day. Thanks for reading, I'll be back once a month with updates. The Ferrari 488 GTB Introducing the new addition to the Ferrari family, the Ferrari 488 GTB. I paid a visit to H.R Owen Ferrari Atelier yesterday to see what all the fuss was about, now this IS a stunning car. The 488 GTB will set you back £231,820 if you have it kitted out like the one on display, this is the only one in the country and orders are being taken. It's an extremely powerful car reaching 62 mph in just 3 seconds, and a maximum speed of 205 mph. There is a huge choice of interior and exterior colours and finishes to choose from to have your car personalised. To help you decide, your options and choices are displayed on a huge screen as computer generated images in the comfort of Mark Spence's office. Best to be sure before you commit to signing on the dotted line. This link will take you to the website. If you are in Knightsbridge, London, over the Bank Holiday weekend call in and take a look for yourself, if you have a spare quarter of a million pounds this could be just the car for you. 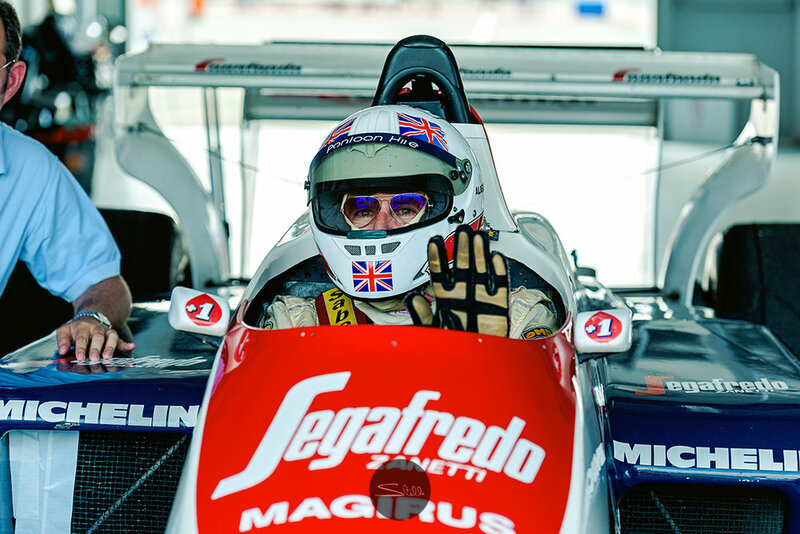 On Sunday 21 June in partnership with John Surtees OBE and the Henry Surtees Foundation, Hever Castle presented a collection of F1 cars, classic cars and motor bikes from the John Surtees collection. John Surtees OBE is a force to be reckoned with, not only did he achieve world championships on both two wheels and four wheels and the only person ever to have done so, he was a four-time 500cc motorcycle World Champion too. John also founded the Henry Surtees Foundation as a result of a freak accident that ended his 18 year old sons life at Brands Hatch on 19th July 2009. Henry was one of the best young drivers of his era. The foundation was created to assist people with brain or physical injuries caused by accident to return to community living by the provision of support for equipment and facilities. The day was very well attended, John shared a few of his racing memories with his audience, many had their own little piece of history to share with him, about how their grandfather knew his father, or when they watched him race at Crystal Palace, it really showed what a great man he is, his spirit shone. John spent much of the day signing memorabilia sold to raise funds. 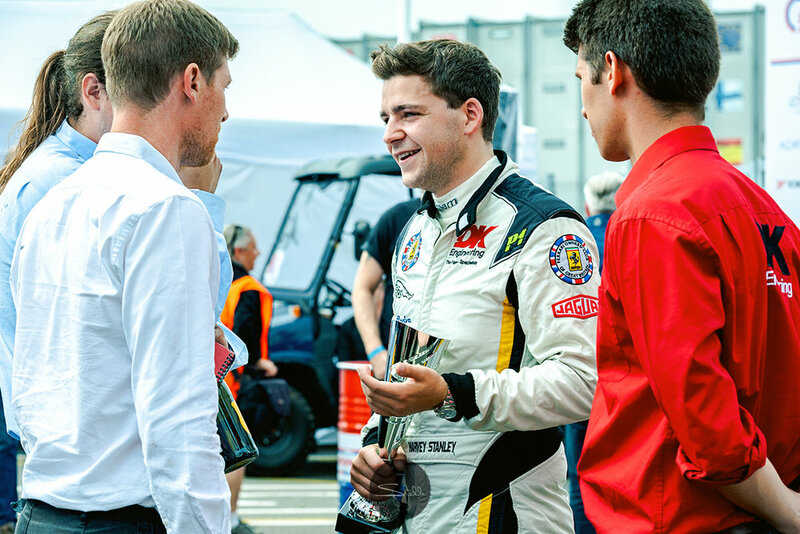 It is through events like this that the Henry Surtees Foundation is helping so many people recover from brain or physical injuries. To buy a copy of the book 'My Incredible Life on Two & Four Wheels' please click here. During the day on display in The Moat Restaurant were a selection of my classic and super car photographs from my exhibition " A Drive Down Memory Lane". 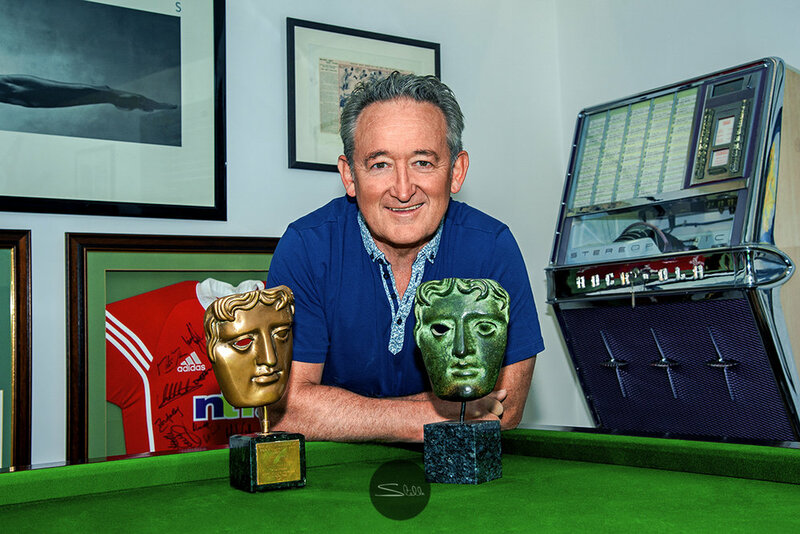 To be amongst the first to buy a framed photograph, limited to 25 per image, please click this link, ten percent of all sales will be donated to the Henry Surtees Foundation. The exhibition will be at the RAC, Pall Mall, London in the autumn. Visit Hever Castle & Gardens for the perfect day out in Kent. The gardens are stunning all year round, set in 125 acres, I took the photographs below on the day. Bye for now, enjoy the sunshine! Following on from my last newsletter about the setting up of The Elite London Show a luxury lifestyle experience, set in the opulent surroundings of the Rizon Jet facility at Biggin Hill Airport. The Elite London Show days on Friday and Saturday didn’t fail to wow the audience with a prestigious array of ‘boys toys’ guaranteed to satisfy the most discerning customer. I had the pleasure of interacting with the exhibitors and customers alike, to photograph the emotion of the second Elite London Show. What stood out the most for me was the passion the exhibitors had for their products and craft. Here are a few of the photographs I took at the Elite London show days with a brief description underneath. The photographs above show some of the exhibitors showcasing helicopters, supercars and inspirational sculptures. All the images were taken using Nikon equipment with a 70-200mm f2.8 lens. The photograph of the hangar above was taken using Nikon equipment with a 24-120mm lens. The HDR process which I wrote about on my previous newsletter will tell you how it is produced. The photographs above capture different moments at the show in particular the Spitfire flypast, bottom right. The WWII plane captivated the audience with agile acrobatics, a fast shutter speed was a must for this shot. and the Henry Surtees Foundation, Hever Castle presents a collection of F1 cars, classic cars and motor bikes from the John Surtees collection. I have been invited to showcase my classic and supercar photography at this prestigious event with framed Limited Edition photographs for sale. using a Leica medium format camera. What I particularly love about photographing with a Leica is the quality of the lens, capturing crystal clear clarity. Thanks for reading I’ll be back in two weeks time with more news. A couple of years ago I was commissioned to photograph a private collection of classic and supercars as a special gift to the owner from his wife, so he could see and appreciate his collection all together in one place. The result was a beautiful handcrafted, limited edition photography book.It was important to me to make sure that we had planned where each car was to be photographed - the location, the time of day and the lighting, the rest is instinctive. There were over 20 cars in the collection and each one had it's own character I wanted to showcase. Every location chosen had a special meaning to the owners and each came with it's own challenges, but one in particular stayed in my mind and it's this one I'd like to share with you, the Fiats - their two everyday cars, that they most probably have spent most time in. The photographs below give a step by step guide to the process I went through to get to the end result. I chose to do this shoot at the beginning of May so we could spend the afternoon setting up in preparation for when the sun went down. I had postponed this numerous times as the conditions weren't right. The first photograph above shows the cars in position. The above photograph shows the angle I positioned my tripod with the Nikon D700 firmly attached, the lens I used was the 24-120mm. I set my Nikon SB910 speed light remotely inside the Fiat Abarth, with lighting at the front and either side of the cars. There was a flicker of light from the house and a couple of domestic outside lights too. As the sun began to set an additional light was added in the outside seating area, with a flicker from the tea lights on the table and to the right of the house as well. From the image above you will notice that lights have been added to the tree on the left and another garden light to match the one on the right. Many exposures were taken so I could check the lighting was just how I wanted it, my lighting technician was very patient as we balanced the lights to compliment the lighting inside the house. It was precision timing to balance this before we had lost all the natural light. The end result below, is just as I had imagined with some careful tweaking in Photoshop to achieve the results I wanted. This photograph and others from the book will be featuring at the RAC Pall Mall, London in the Autumn, with the opportunity to buy limited edition framed photographs. A small selection will also be on display at Hever Castle for Father's Day on Sunday 21 June 2015. I'll keep you posted as we get nearer the time. If after reading this it has inspired you to commission a shoot please do get in touch,Father's Day is just around the corner.